Every guy has his Moriarty or Doctor Doom. His arch-nemesis that borders on the fringe of his every thought, and lies in wait for him at every turn. For me that ‘person’ is Math. I’ve never had a head for it, never claimed too and the closer I got towards exam time over algebra and the arithmetic legion, the more like kryptonite they felt. I used to jokingly protest that no good could come of it, and tomorrow I’ll be proven right when a member of the Fantastic Four comes one step closer to dying in current storyline Three. See? Subtraction kills folks. Still before that issue hits, lets flip back though each of the possible victims and find out where writer Jonathan Hickman left them last issue (585), in the hopes of figuring out who will kick the bucket. Reed Richards: Has gone with Galactus to the far reaches of space, as the Devourer of Worlds plans to confront those who killed his future self. While Galactus reveals he fears what Franklin will become, Reed states to the Human Torch before departing alone “I know where this is headed”. The Invisible Woman: An underseas ambassador and always in the favour of Namor the Sub-Mariner, Susan is witness to land settlement meeting between two empires. When Namor suddenly kills the rival King, the Invisible Woman finds herself trapped between the two hostile parties. The Human Torch: Left on Earth to take care of the family, The Human Torch is the only powered member of the Four left on the planets surface. Unbeknown to him Annihilus is planning to unleash upon the planet his "second great Annihilation wave". The Thing: Reverted temporarily to his human form, Benjamin Grim is enjoying the joys of being human. In Latveria, Dr Doom plans to abdicate his throne in the name of being reborn. A mantle which would quickly be restored with vengeance upon the cornerstone member of the Fantastic Four. Hmm not clear anymore is it? From my perspective it's just great having the core FF villains back in the Fantastic Four! 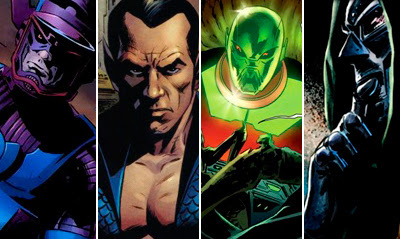 Namor included. For too long these great aspects of the title have been off enriching other books, so it's good to see them all back where they belong. As for the death, check out this teaser of Fantastic Four #586 and see what other clues you can find! If the Invisible Woman disappears - would anyone know? (very lame attempt at humour). Sorry Craig I wrote that post badly, what I meant to say is this week was the penultimate chapter to the big death. Not the one with the death in it. I thought I'd do posts on the eve of each issue so non-FF readers can keep up with the mystery and play along at home, so will update where ll the chess pieces are at a month from now too.